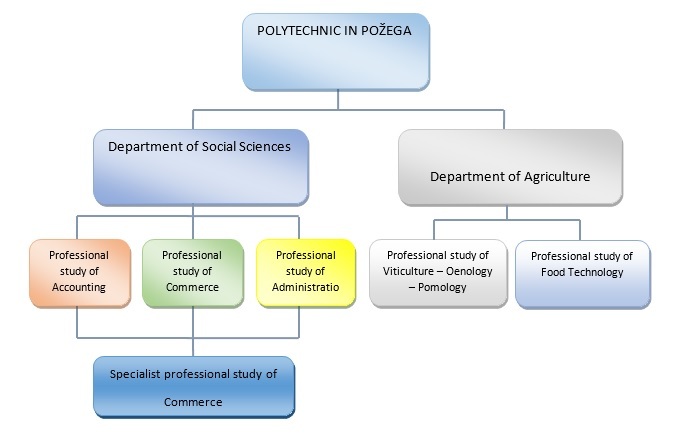 Organisational elements of the Polytechnic of Požega are its departments. A department, acting as the organisational element of the Polytechnic, is the basic element in performance of studies, professional and scientific work, and each one may establish one or more studies with or without specialisations. Studies are organisational elements within the departments. The Polytechnic may open new studies as needed within the framework of the existing departments as well as new departments. Activities of a department are managed by a head of the department. The department head and the Council are bodies of the department. The Department Council consists of the teaching staff employed at the Polytechnic department, a representative of associates employed at the Polytechnic department and a students' representative. At the Department of Agriculture, special organisational units have been established to advance the profession, perform a practical portion of the teaching activities, professional and scientific activities within the Viticulture-Oenology-Pomology study and the technology study. teaching facility of Wine Cellar and Laboratory (which also includes a teaching test plot – a perennial vineyard and orchard).